Barcelona's Municipal Institute of Housing and Renovation administers over 7,000 rental homes to ensure the right to housing for all the city's residents. Through its Municipal Institute of Housing and Renovation, Barcelona City Council is maintaining its commitment to promoting a high-quality, affordable Public Housing Stock below market prices. The public housing stock aims to guarantee that no dwelling unit will be without a home in situations of social emergency, while also promoting high-quality housing at below-market prices in order to ensure accessibility to housing. However, Barcelona City Council cannot build all the housing it needs to cover current demand immediately. For this reason, the added value of this public housing stock is to foster the coexistence of social housing and dwellings that come from private owners and agreements, as well as purchasing and assignment of housing owned by financial institutions. No results have been found that match this criterion. Do another search or pull down the menu to activate the filters. Type of housing promoted by the IMHAB targeting those people or households affected by urban redevelopments or reorganisation in the city. The properties tend to have a surface area of 65 to 85 square metres and can be acquired on a rental or purchase basis at the same prices as social housing properties. Refers to all properties being rented, promoted by the IMHAB, that target those people or households that need to be adjudicated a home which satisfies their housing needs. To access any of these adjudications, applicants must be registered with the Barcelona Register of Applicants for Social Housing. As part of this category, the successful applicant acquires the property for a period of 75 years at a value that is well beneath the market price. On average, these types of property measure 60 square metres and are built in compliance with sustainability criteria. To access any of these adjudications, applicants must be registered with the Barcelona Register of Applicants for Social Housing. This involves plots of public land allocated to a specific type of cooperative, housing cooperatives, where a group of people organise themselves to promote housing on a plot of land handed over to them by the City Council at an affordable price and by public competition, although it will always remain under public ownership. These are plots of public land allocated to foundations and non-profit organisations that rent out dwellings at affordable prices. They are a collaborative mechanism, but with the novelty that the plots of land will now be awarded through public competition. The Provisional Local Housing programme (APROP) is a new model of quick and sustainable housing construction, which offers a temporary response to residents that are excluded or at risk of exclusion, in areas close to their original neighbourhoods. They are prefabricated mobile modules that guarantee quality standards, are distributed throughout the city and take into account diverse resident profiles. The City Council is allocating a plot of land for housing in a process now underway for holding the project’s relevant invitations to tender, awarding and construction. From when the plot of land is put out to public tender, for choosing the companies and professionals that will be commissioned with the project and its building work, to when the successful tenderers are announced and the building project can then go ahead. This includes both the implementation of the project through the work and building process and the relevant dwelling award process. The dwellings have been built and handed over to the successful applicants. Do you want to know more about the Public Housing Stock? These dropdown menus show the types and main characteristics of the dwellings in Barcelona's public housing stock. What is the Public Housing Stock? Barcelona's Municipal Institute of Housing and Renovation administers over 7,000 rental homes throughout the city, allocated to ensure the right to housing for all the city's residents. Everyone who applies for one of these dwellings, either for renting or any of the other available modalities, must be on the Barcelona Social Housing (HPO) Applicants Register. Barcelona City Council is actively working to increase its public housing stock with new buildings and properties distributed throughout the city, together with new tenancy regimes such as cohousing. Social rentals: Rented accommodation, aimed at all those people who are in need of housing. Building leases: aimed at facilitating access to social-housing accommodation. The grantee acquires the ownership of the dwelling for a long period of time, but the land remains the property of the Administration. People affected by urban planning: rented or owned housing for people affected by, or forced to move because of, new urban-planning developments. Direct adjudication by the promoter: these dwellings, supplied by the promoter, have also been included with the aim of increasing the public housing stock. Senior citizens are one of the most vulnerable social groups in our society. They often have fewer economic resources, live in inadequate housing and have special needs and requirements. The aim is to offer senior citizens a safe, adapted, comfortable home that is integrated into the city. They also have to be provided with any services and care that they may need: 24-hours-a-day specialised service, direct, personal care at the centre, and telecare that provides them with self-sufficiency. Applicants must be on the Barcelona Social Housing (HPO) Applicants Register. They must be 65 years old or over. They must have a certain amount of self-sufficiency. Their income must be below an amount that is 2.5 times the Public Indicator of Multiple Effect Income (IPREM). The housing needs, family and personal circumstances and any current residence accessibility problems will also be taken into account. The Municipal Institute of Housing and Renovation promotes rented social housing for all those people or dwelling units that need the adjudication of a home which satisfies their housing needs. In order to qualify for one of these adjudications, you must be on the Barcelona Social Housing (HPO) Applicants Register and comply with the established requirements. In this category, the person who is adjudicated the dwelling acquires ownership for a period of 75 years, at a price well below market value, but the land remains the property of the Administration. The housing in leasing promotions usually have an average usable surface area of 60 m², and they are built using sustainable construction methods that the Municipal Institute of Housing and Renovation applies in all of its housing promotions. This type of housing promoted by the Municipal Institute of Housing and Renovation is aimed at those people or dwelling units affected by urban redevelopments or reorganisation aimed at improving the city of Barcelona. The homes are built using sustainable construction criteria and usually have a usable surface area of between 65 and 85 m². The dwellings may be rented or purchased, at the same prices as for social-housing accommodation. However, in order to qualify for one of these adjudications, you must be on the Barcelona Social Housing (HPO) Applicants Register and comply with the established requirements. 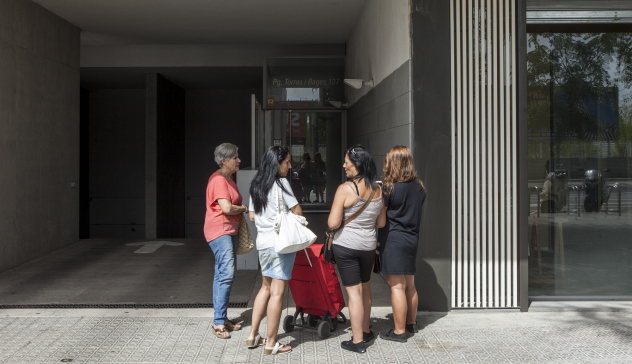 Another option for all those people who need access to housing at below-market prices, and who are registered on the Barcelona Social Housing (HPO) Applicants Register, is to go straight to the promoters. The properties commercialised by these private operators come from housing that has become vacant after the adjudication processes carried out by the Housing Consortium. The homes are transferred to the promoters, and they are then responsible for their commercialisation and adjudication. But in order to qualify for any of these homes, the requirements are to be on the register, along with any other requirements established by the promoters. You can find more information and consult the promotions carried out through Barcelona's Municipal Institute od Housing and Renovation (CAT).